This short, grass-like plant is a member of the sedge family, Cyperaceae. 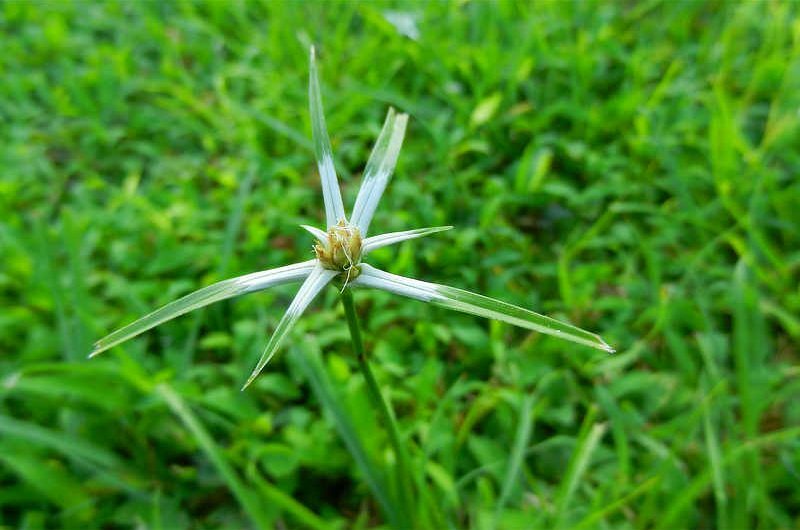 It is characterized by the presence of leaf-like bracts, which have a white basal portion, giving it a star-like appearance. The bracts surround the inflorescence, which sits on top of the plant. The inflorescences are called “spikelets”, and each spike contains several tiny flowers. Like grasses and rushes, sedges are pollinated by wind; however, because of the flower-like bracts, it may attract insect pollinators. The White-top Sedge is found in gardens, orchards, fields and other open areas throughout the Neotropics. It often prefers shady areas and generally dry soil. This beautiful sedge is common along the forest edges and open areas in Panama, and is an attractive plant, often catching the eye of our guests at our lodges.